Bucket elevators are devices used for transporting different types of materials vertically. These bucket elevators are generally designed for either a centrifugal or a continuous design. Centrifugal bucket elevators are ideal for powdered solids including: sand, sugar, grains, chemicals, etc. This type of bucket elevator utilizes a high speed centrifugal force to toss the materials from the bucket into the targeted area. Continuous bucket elevators, however, are preferred for applications which involve fragile materials. This design operates at a slower speed and uses the force of gravity to discharge the materials. More complex bucket elevators can be designed to unload materials at a variety of intervals and these systems can be equipped with different accessories that allow for various features. Since certain types of bucket elevators are ideal for particular applications then this type of machinery can be customized to meet the specialized need of the project. Bucket elevators are particularly popular in the agricultural industry at granaries and large farms. 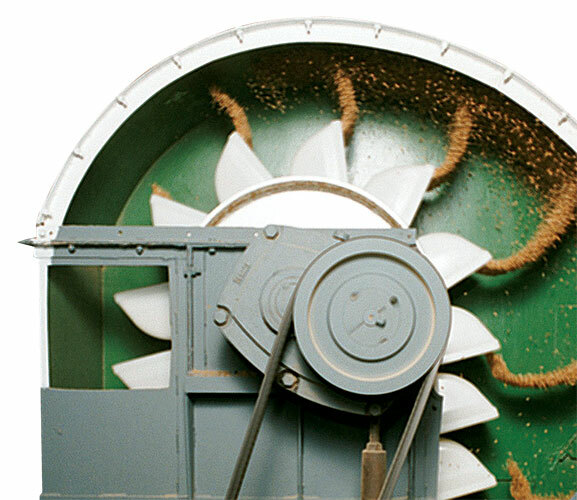 In these applications, the elevator allows for maximum output while minimizing the damage to the grain. Minimal damage is especially important if the grain is intended to be used for seeding at some point. In bulk material handling scenarios that include mining, pharmaceuticals and more, bucket elevators create an efficient way to move materials to a target area. The highly controllable machinery can be optimized for the system that it is integrated with, and power output can be adjusted based on the average particle weight of materials being moved. The result is a machine that enhances efficiency in a large system that is continually processing bulk material. A bucket elevator is a low maintenance solution that has the ability to transport a high volume of bulk material in one simple motion. Bucket Elevators Bucket elevators are devices used for transporting different types of materials vertically. These bucket elevators are generally designed for either a centrifugal or a continuous design.